A developing ovine foetus does nearly 70% of its growth in the final 6 weeks of gestation. As the unborn lamb grows, so does the energy demand placed on the heavily pregnant ewe. The more lambs she carries, the greater her daily energy requirement. Twin lamb disease (pregnancy toxaemia) results from an inadequate dietary energy intake by the ewe. To maintain the growth rate of her unborn lambs she supplies them with extra energy from her own body reserves – her own backfat. The fat is transported to the liver where it is broken down into useable units called ketone bodies (rather like sawing a tree into logs). However, if the energy deficit is too great and the ewe mobilises too much fat, the level of ketone bodies in the blood actually begin to poison her and she goes down with twin lamb disease. Ensuring she receives a balanced ration with sufficient dietary energy is the best way to reduce the risk of twin lamb disease. Crystalyx Extra High Energy offers a very high energy content to help bridge any dietary shortfall, together with trace elements, minerals and vitamins to stimulate forage digestion and fermentation in the rumen. And because it is available 24 hours a day, even shy feeders get a chance to lick it. But perhaps best of all, Crystalyx never replaces forage in the diet – it complements and balances it. 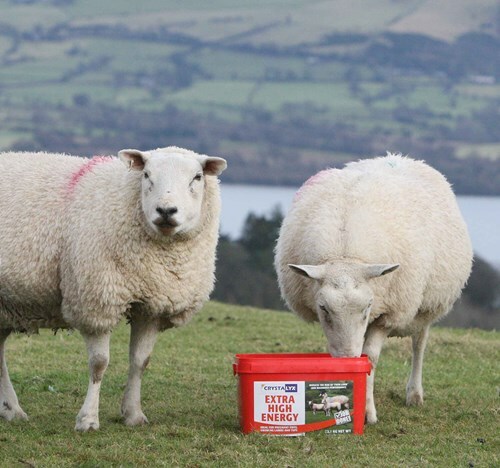 Therefore Crystalyx intakes can be used as a true guide to the adequacy of the ration being fed – high intakes mean the ewes are short of energy. This entry was posted in Farming Interest. Bookmark the permalink. Crystalyx Feed Blocks provide research-proven feed & supplementation to tens of millions of cattle and sheep worldwide.